Mormon Pioneer and Explorer Nephi Johnson was guided to Zion Canyon in November, 1858 by a friendly Paiute Indian, and was probably the first European-American to see The Narrows. Soon after, in 1861 and 1862, the towns of Virgin and Springdale, just south of Zion Canyon, were founded. The next year, Isaac Behunin built a cabin in upper Zion Canyon for summer farming. The Narrows was first descended (and named) in 1872 by geologist and explorer Grove Karl Gilbert as part of the Wheeler Survey. His party traveled from Navajo Lake through the Narrows to Zion Canyon and Springdale on horseback. John Wesley Powell had traversed the nearby Parunaweap Canyon (the East Fork of the Virgin) earlier in the same year. From when Zion became a National Park (1919), tourists were guided up the Narrows on horseback well into the 1960s. The through-hike of The Narrows became popular starting in the late 1960s. The Virgin River runs south through upland aspen forest from near Navajo Lake at 9,200 feet (2,800 m) elevation, 11 miles (18 km) to Chamberlain's Ranch, 5,900 feet (1,800 m), where the through-hike of The Narrows starts. The river turns west and a gorge starts to form within 2 miles (3.2 km). 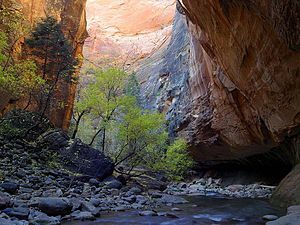 By the time the North Fork enters Zion National Park, 5 miles (8.0 km) from Chamberlain's Ranch, the gorge is 500 feet (150 m) deep. three and a half miles (5.6 km) further, at the confluence with Deep Creek, the gorge is 1,300 feet (400 m) deep, and the combined river turns south. The gorge from here is continuous and has vertical sandstone walls from 40 to 100 feet (12 to 30 metres) apart, with pockets of forest on both sides. From Deep Creek to Big Spring is 2.7 miles (4.3 km). At Big Spring, the canyon narrows again, and the true Narrows begin. For most of the next 3.6-mile (5.8 km) stretch to the Mouth of the Narrows, the river runs wall to wall, with vertical sandstone cliffs on both sides. A mile (2 km) south of the Mouth of the Narrows is the Temple of Sinawava, where the river enters main Zion Canyon, a flat-floored, quarter to half-mile (400 to 800 m) wide canyon with sandstone mountains on each side, their summits 2,400 feet (730 m) above. Eight miles (13 km) further south, where the canyon widens again, is the town of Springdale and the southern boundary of Zion National Park. Hiking The Narrows is arguably the quintessential Zion experience. The Narrows can be hiked either as a top-down through-hike from Chamberlain Ranch to the Temple of Sinawava, or as an up-and-back bottom-up hike from the Temple of Sinawava. Hiking is done largely in the river as, for a third of the route, the river runs canyon wall to canyon wall. Water levels change from season to season; most hikers will wade at least waist-deep and many will swim a few short sections. The Narrows hike from the bottom up starts at the Temple of Sinawava and ends as far as Big Springs at the 5-mile mark, although most people find Orderville Canyon an adequate destination. As opposed to the top-down Narrows hike, this hike does not require a permit. Around the first bend is Mystery Falls, the exit point for Mystery Canyon. At the 2.5-mile point is Orderville Canyon, beyond which lies the famous Wall Street section of the Narrows, aptly named after the sheer cliff walls surrounding the trail. After this section, the water gets periodically deeper and may require swimming in certain areas. One will need to negotiate a series of boulders at the 4-mile mark, and reach Big Springs at the 5-mile mark, where one is required to turnaround. The entire hike up to Big Springs is 10-miles and may require up to 8 hours. The through-hike can be done in a day or as a two-day backpack trip. Chamberlain's Ranch is accessed by the dirt North Fork Road east of the Park, and is situated in a rolling forest of aspen and scrub oak. No sign of the spectacular gorge ahead can be seen from the ranch. The hiker proceeds down the river and into an ever-deepening gorge, eventually getting to The Narrows and ending at the Temple of Sinawava. The hike is 16 miles (26 km) long and is very tiring because it is in the river itself. Permits are required before hiking the Narrows from the top and can be obtained at the Zion National Park Wilderness Desk. Reservations should be made ahead of time as permits can be difficult to get during the summer months. ^ "The Narrows - Zion National Park (U.S. National Park Service)". www.nps.gov. Retrieved 2017-12-18. ^ Herbert, Gregory (1950). Geology and Geography of the Zion Park Region Utah and Arizona. Washington, DC, USA: US Department of the Interior, Geological Survey Professional Paper 220. ^ a b Greg,, Benchwick,. Zion & Bryce Canyon National Parks. McCarthy, Carolyn (Carolyn Marie),, Pitts, Christopher, (3rd ed.). Carlton, Victoria. ISBN 9781742202013. OCLC 946542130. A History of Southern Utah and Its National Parks, Angus M. Woodbury (Utah State Historical Society, Vol XII Nos. 3-4, July–October 1944; revised and reprinted, 1950 (No ISBN, no further publishing information available)). Brereton, Thomas; James Dunaway (1988). Exploring the Backcountry of Zion National Park: Off-Trail Routes (revised ed.). Springdale, UT: Zion Natural History Association. ISBN 0-915630-25-7. Gregory, Herbert E. (1950). Geology and Geography of the Zion Park Region Utah and Arizona. Washington DC: United States Department of the Interior, Geological Survey Professional Paper 220. This page was last edited on 4 October 2018, at 08:26 (UTC).